Figure 1: NVIDIA Tensor RT provides 16x higher energy efficiency for neural network inference with FP16 on Tesla P100. Editor’s Note: An updated version of this, with additional tutorial content, is now available. See “How to Speed Up Deep Learning Using TensorRT“. 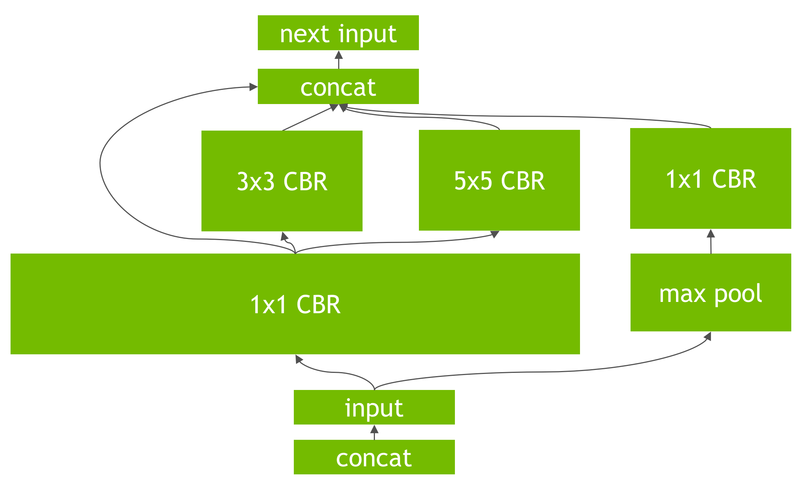 NVIDIA TensorRT is a high-performance deep learning inference library for production environments. Power efficiency and speed of response are two key metrics for deployed deep learning applications, because they directly affect the user experience and the cost of the service provided. 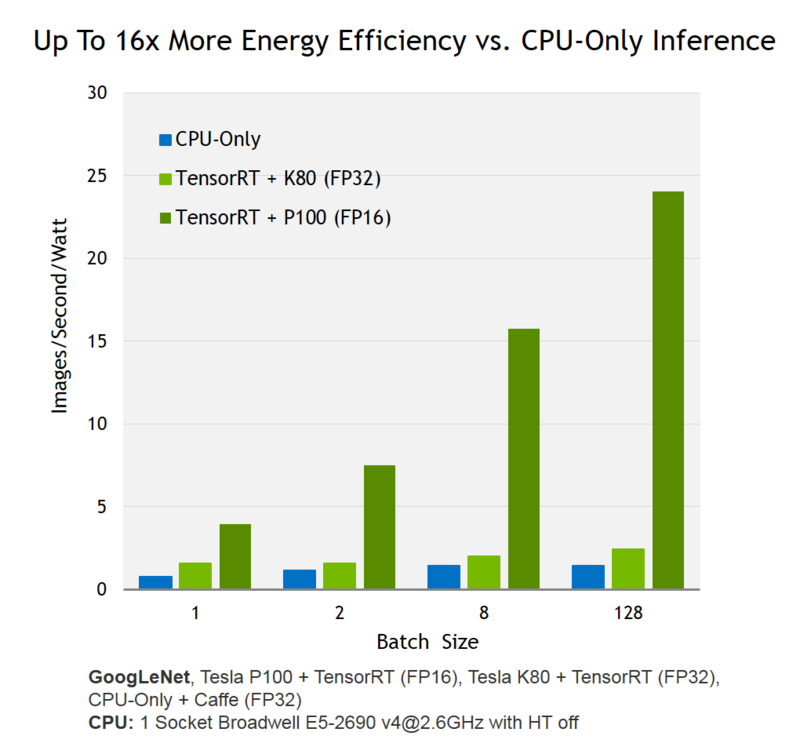 Tensor RT automatically optimizes trained neural networks for run-time performance, delivering up to 16x higher energy efficiency (performance per watt) on a Tesla P100 GPU compared to common CPU-only deep learning inference systems (see Figure 1). 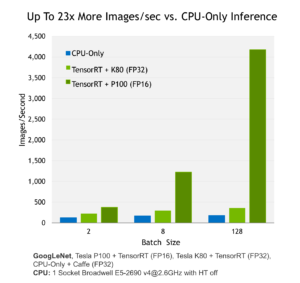 Figure 2 shows the performance of NVIDIA Tesla P100 and K80 running inference using TensorRT with the relatively complex GoogLenet neural network architecture. In this post we will show you how you can use Tensor RT to get the best efficiency and performance out of your trained deep neural network on a GPU-based deployment platform. Figure 2: NVIDIA Tensor RT provides 23x higher performance for neural network inference with FP16 on Tesla P100. Solving a supervised machine learning problem with deep neural networks involves a two-step process. The first step is to train a deep neural network on massive amounts of labeled data using GPUs. During this step, the neural network learns millions of weights or parameters that enable it to map input data examples to correct responses. Training requires iterative forward and backward passes through the network as the objective function is minimized with respect to the network weights. Often several models are trained and accuracy is validated against data not seen during training in order to estimate real-world performance. The next step–inference–uses the trained model to make predictions from new data. During this step, the best trained model is used in an application running in a production environment such as a data center, an automobile, or an embedded platform. For some applications, such as autonomous driving, inference is done in real time and therefore high throughput is critical. Figure 3: Deep learning training to deployment workflow with NVIDIA DIGITS and Tensor RT. To learn more about the differences between training and inference, see Michael Andersch’s post on inference with GPUs. The target deployment environment introduces various challenges that are typically not present in the training environment. For example, if the target is an embedded device using the trained neural network to perceive its surroundings, then the forward inference pass through the model has a direct impact on the overall response time and the power consumed by the device. The key metric to optimize is power efficiency: the inference performance per watt. Performance per watt is also the critical metric in maximizing data center operational efficiency. In this scenario, the need to minimize latency and energy used on large volumes of geographically and temporally disparate requests limits the ability to form large batches. 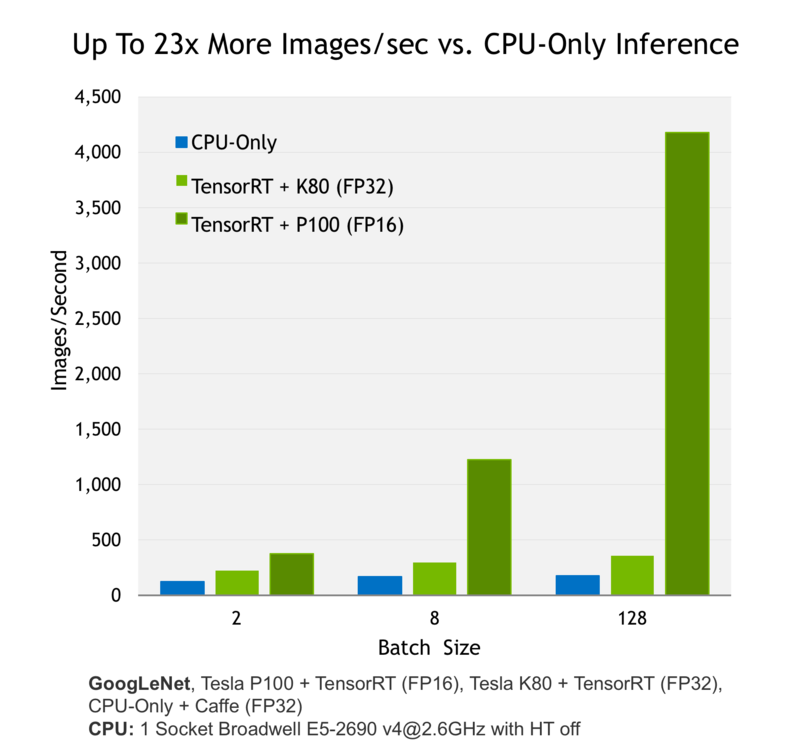 Tensor RT is a high-performance inference engine designed to deliver maximum inference throughput and efficiency for common deep learning applications such as image classification, segmentation, and object detection. Tensor RT optimizes your trained neural networks for run-time performance and delivers GPU-accelerated inference for web/mobile, embedded and automotive applications. Figure 4: The TensorRT workflow, showing the two key functionalities of TensorRT: the TensorRT neural network optimizer (middle) and the TensorRT target runtime (right). There are two phases in the use of TensorRT: build and deployment. 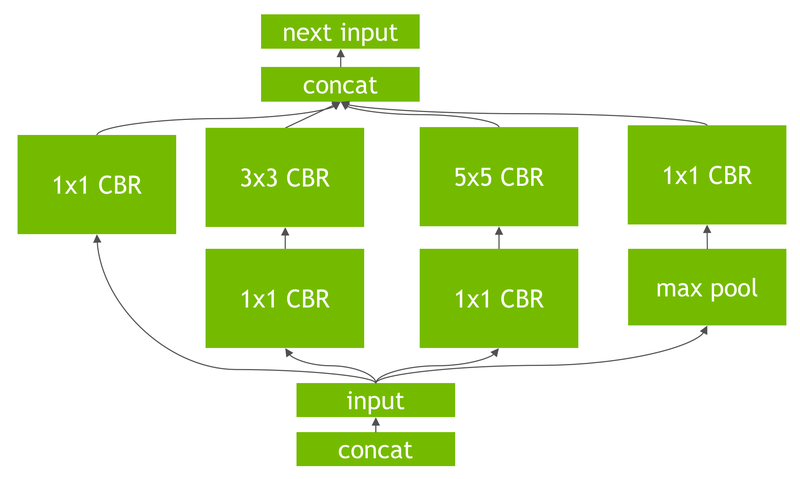 In the build phase, TensorRT performs optimizations on the network configuration and generates an optimized plan for computing the forward pass through the deep neural network. The plan is an optimized object code that can be serialized and stored in memory or on disk. The deployment phase generally takes the form of a long running service or user application that accepts batches of input data, performs inference by executing the plan on the input data and returns batches of output data (classification, object detection, etc). With TensorRT you don’t need to install and run a deep learning framework on the deployment hardware. Discussion of the batching and pipeline of the inference service is a topic for another post; instead we will focus on how to use TensorRT for inference. A label file to provide a name for each output class. In addition, you must define the batch size and the output layer. Code Listing 1 illustrates how to convert a Caffe model to a TensorRT object. The builder (lines 4-7) is responsible for reading the network information. Alternatively, you can use the builder to define the network information if you don’t provide a network architecture file (deploy.prototxt). Tensor RT supports the following layer types. You can also use the Tensor RT C++ API to define the network without the Caffe parser, as Listing 2 shows. You can use the API to define any supported layer and its parameters. You can define any parameter that varies between networks, including convolution layer weight dimensions and outputs as well as the window size and stride for pooling layers. After defining or loading the network, you must specify the output tensors as line 13 of Listing 1 shows; in our example the output is “prob” (for probability). Next, define the batch size (line 16), which can vary depending on the deployment scenario. Listing 1 uses a batch size of 1 but you may choose larger batch sizes to fit your application needs and system configuration. 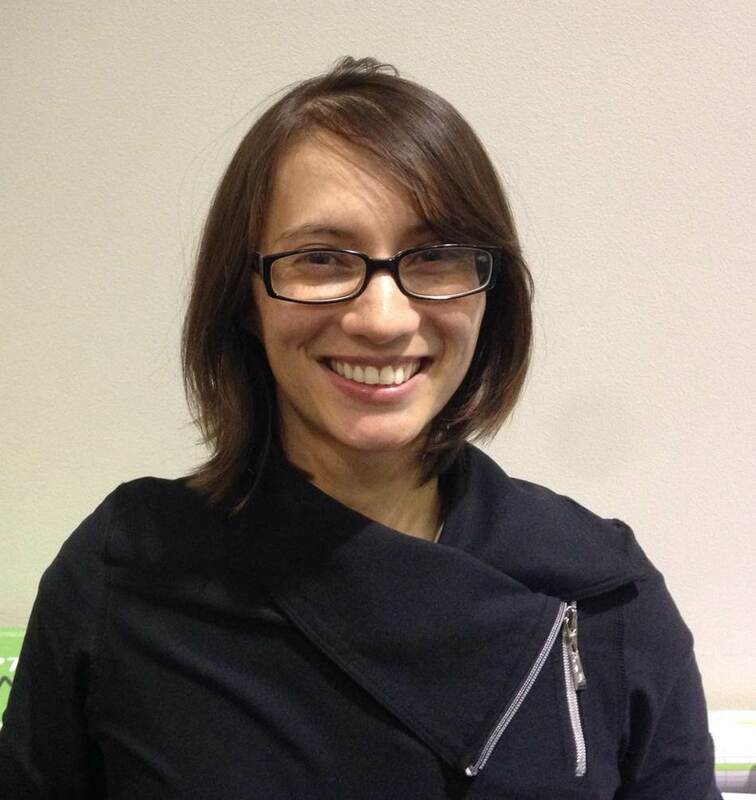 Underneath, TensorRT performs layer optimizations to reduce inference time. While this is transparent to the API user, analyzing the network layers requires memory, so you must specify the maximum workspace size (line 17). The last step is to call buildCudaEngine to perform layer optimization and build the engine with the optimized network based on your provided inputs and parameters. Once the model is converted to a TensorRT object it is deployable and can either be used on the host device or saved and used elsewhere. 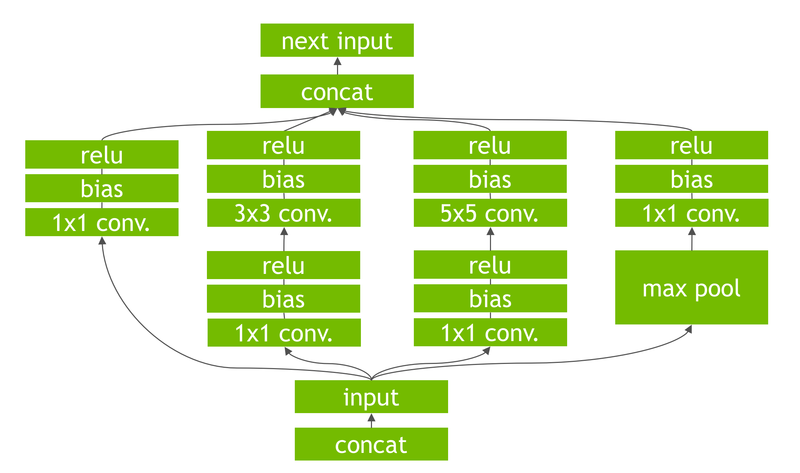 TensorRT performs several important transformations and optimizations to the neural network graph. First, layers with unused output are eliminated to avoid unnecessary computation. Next, where possible convolution, bias, and ReLU layers are fused to form a single layer. Figure 6 shows the result of this vertical layer fusion on the original network from Figure 5 (fused layers are labeled CBR in Figure 6). Layer fusion improves the efficiency of running Tensor RT-optimized networks on the GPU. Figure 5: An example convolutional neural network with multiple convolutional and activation layers. Another transformation is horizontal layer fusion, or layer aggregation, along with the required division of aggregated layers to their respective outputs, as Figure 7 shows. Horizontal layer fusion improves performance by combining layers that take the same source tensor and apply the same operations with similar parameters, resulting in a single larger layer for higher computational efficiency. The example in Figure 7 shows the combination of 3 1×1 CBR layers from Figure 5 that take the same input into a single larger 1×1 CBR layer. Note that the output of this layer must be disaggregated to feed into the different subsequent layers from the original input graph. TensorRT performs its transformations during the build phase transparently to the API user after the TensorRT parser reads in the trained network and configuration file, as Listing 1 shows. The inference builder (IBuilder) buildCudaEngine method returns a pointer to a new inference engine runtime object (ICudaEngine). This runtime object is ready for immediate use; alternatively, its state can be serialized and saved to disk or to an object store for distribution. The serialized object code is called the Plan. As mentioned earlier, the full scope of batching and streaming data to and from the runtime inference engine is beyond the scope of this article. Listing 3 demonstrates the steps required to use the inference engine to process a batch of input data to generate a result. // input and output tensors. TensorRT 1.0 is now available as a free download to the members of the NVIDIA Developer Program. Get started today and tell us about your experience in the comments section below. NVIDIA TensorRT enables you to easily deploy neural networks to add deep learning capabilities to your products with the highest performance and efficiency. During the build phase TensorRT identifies opportunities to optimize the network, and in the deployment phase TensorRT runs the optimized network in a way that minimizes latency and maximizes throughput. If you are running web or mobile applications that are backed by data center servers, TensorRT’s low overhead means that you can deploy more varied and complex models to add intelligence to your product that will delight your users. 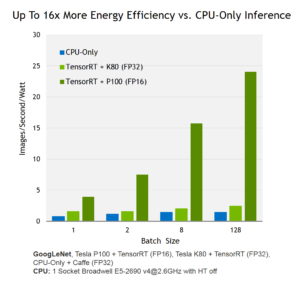 If you are using deep learning to create the next generation of smart devices, TensorRT helps you deploy networks with high performance, high accuracy, and high energy efficiency. Moreover, TensorRT enables you to leverage the power of GPUs to perform neural network inference using mixed-precision FP16 data. Performing neural network inference using FP16 can reduce memory usage by half and provide higher performance on Tesla P100 and Jetson TX2 GPUs. Come to the GPU Technology Conference, May 8-11 in San Jose, California, to learn more about deep learning deployment with TensorRT. GTC is the largest and most important event of the year for GPU developers. Register by April 5th to get the early bird discount rate, and use code CMDLIPF to receive an additional 20% off! TensorRT will feature in the following talks and instructor-led labs. Chris Gottbrath is an Accelerated Computing Software Product Manager working to deliver products that help users accomplish critical missions. Prior to NVIDIA he delivered software development tools to customers in the High Performance and Scientific computing markets. He lead the introduction of CUDA debugging into the popular TotalView debugger used by computational scientists around the world to create highly scalable parallel codes. 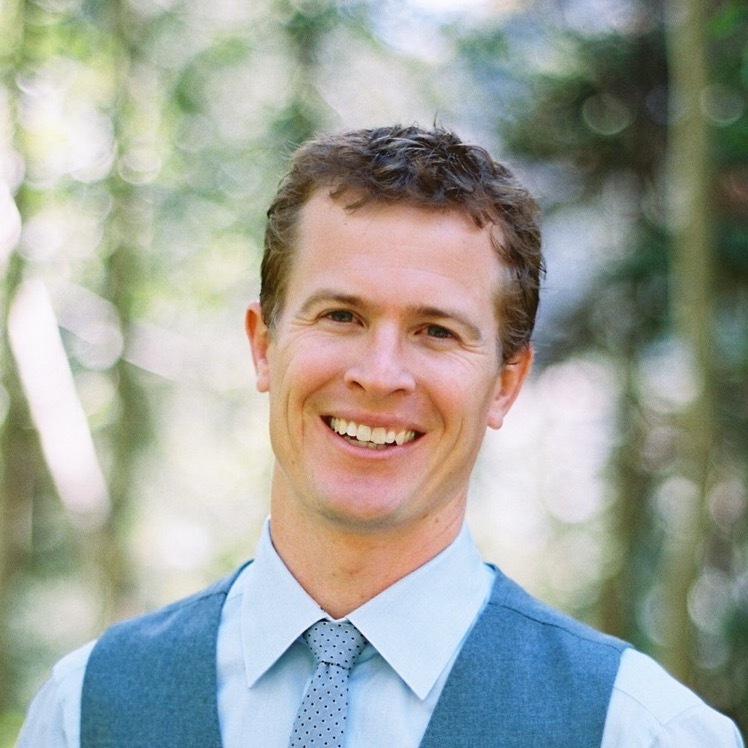 Ryan Olson is a Solutions Architect in the Worldwide Field Organization at NVIDIA. His primary responsibilities involve supporting deep learning and high performance computing applications. Shashank Prasanna is a product marketing manager at NVIDIA where he focuses on deep learning products and applications. 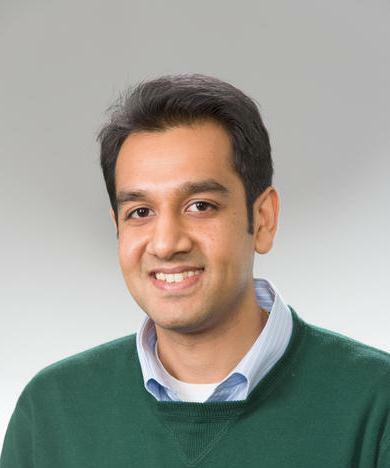 Prior to joining NVIDIA, Shashank worked for MathWorks, makers of MATLAB, focusing on machine learning and data analytics, and for Oracle Corp. designing and developing CRM software. Shashank holds an M.S. in electrical engineering from Arizona State University.